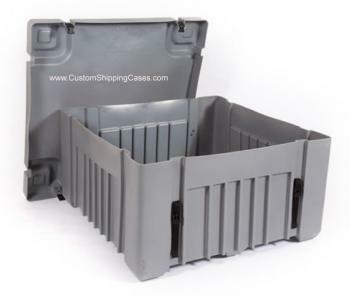 This 48" x 40" Jumbo shipping tub is Roto-Molded from rugged polyethylene and comes equipped with 4 Heavy duty web straps and quick release buckles. Case rolls easily on 5 Integrated ball bearings and is stackable, designed with internal slots to allow compartment capabilities. The Lid is 4"deep and will telescope to allow 27" of internal depth. Inside Dimensions: 48.00" × 40.00" × 24.00"
Exterior Dimensions: 51.00" × 43.00" × 29.00"